It seems like just yesterday I sat down to discuss my first quarter goals. This second quarter flew by with a bunch of things on my schedule, keeping me busy and semi-productive. With an out-of-state wedding, (long-overdue and much needed) family time, an inconvenient car accident and my first-ever trip abroad, it was challenging to stay focused and in-tune with the goals I had established for myself, but I felt that I did an okay job staying afloat. 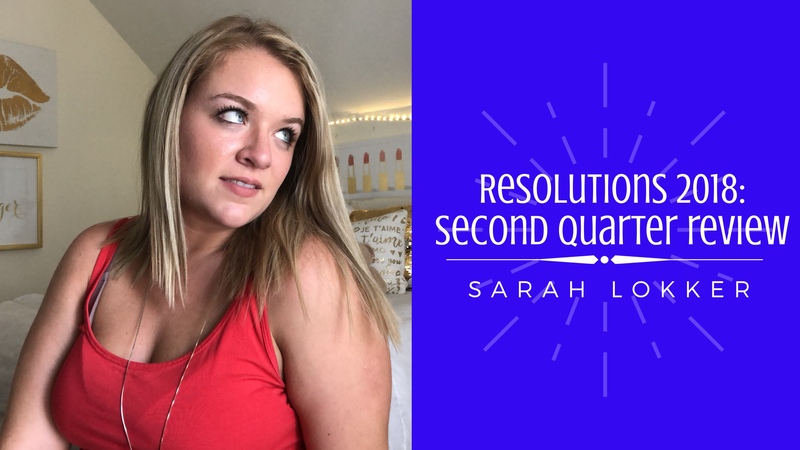 I wasn’t disappointed with myself as I sat down to reflect the quarter, but I also felt as if I didn’t make massive strides towards any personal growth. A lot of the time, I felt myself just rolling through the motions and just taking everything in. It was just a sense of complacency, but without the lingering feeling of anxiousness. I went into the second quarter thinking that if I cut the resolution into smaller, more bite-sized goals, it would make them easier to swallow and achieve. Well, I choked. Even though we have more trips planned in the immediate future, if I’m serious about learning something, you need to invest in the right resources to teach yourself. I want to dedicate some time into finding the best tools to learn, and then subscribe. This will also help in part with the financial aspect because I will be researching something well before purchasing, making sure I’m making the right choice. Speaking of tools for success, I spent a small fortune over the past year on hand lettering tools and I’ve used them all of maybe four/five times! Now is the time to start dedicating a few minutes a week into practicing the redeveloped art form and apply it in my daily life as much as I can. As they say, practice makes perfect! When I tell my friends/family that I’m “too broke” to do things, it’s not like I’m actually broke, compared to the past when I literally had to make $20 ride for two weeks. Rather, I’ve (finally) learned how important it is to prioritize your spending so you’re able to do all you want, while stowing money away in various places. It took me long enough, but I feel a hell-of-a-lot more comfortable with my financial standings, especially as we start to travel more. Budgeting for these upcoming trips would have been terrifying a few years ago, but now I am able to plan accordingly, while still being able to go about my regular spending habits. Stashing away the money per paycheck makes it rewarding when you pull it out from the account and you’re able to breathe easy knowing that you won’t have to rob Peter to pay Paul when you come back. I was really proud of us because we stayed within the budget allotted in Berlin/Amsterdam and we even came home with leftover money! I wasn’t able to pay off that emergency credit card fund, but I did bring it down nearly $265. Like last quarter, I wasn’t putting lot of stupid/unjustified purchases on the card and I feel as if I’m chunking off a lot of the balance on it. The balance of this card is at $450.01, because clearly I can’t math. Because of unforeseen expenses for the trip to Europe, I wasn’t stowing away as much cash as I had anticipated for the rainy day/converted Gen Beauty fund. I had $230 saved up, but after purchasing my tickets for the convention and repaying the credit card with money from the fund, it currently hangs out at around $140. I had open another store credit card (Old Navy) in the second quarter and was able to charge to it and quickly pay it off. I also paid off my JC Penney’s store credit card! However, the Express store credit card wasn’t paid down to $250 because I made purchases for the trip, but I was able to pay off what purchases I made rather quickly and it’s a matter of chipping away at the old debt now. The current balance is at $409, but a payment will be made with my next paycheck to bring it down to $300. If you’ve been following my Workout Splits, then this doesn’t need a real thorough breakdown. Even though I had a lot of hiccups in the second quarter, my confidence is still booming and I no longer feel as disgusted when I look in the mirror. I have come to terms that I am a work in progress and I’m proud of the strides I have made so far, plus I’m excited to see where I can go from here. No one ever wants to be totally ignorant while traveling abroad, but I would have been better off not taking the time to throw my brain into maximum overdrive by learning two languages! This certainly isn’t me complaining because I loved challenging myself, but I think all I retained was how to say ‘excuse me’ (Entschuldigung/Pardon). The time spent learning German and Dutch wasn’t totally wasted, but it has served their purproses. We seldom had to speak the languages since Berlin/Amsterdam are so touristy-friendly, so I won’t be continuing my lessons. Since I have loved learning foreign languages for the past year or so, I’ve decided that in lieu of our upcoming trip to Prague/Budapest in February, I want to take a crack at learning Czech. It’s not to say that I’m learning the language solely for the trip, but I’ve always wanted to learn the language (literally, since I was a little kid, I’ve wanted to), so what better time than now? The Reading Challenge was a literal breeze through April and May, but I let up in June, which I accounted for being my heavy lifting month. I anticipated to crank out and even get a jumpstart with all the time spent traveling, but I spent minimal time reading between the flights/buses. I’ve since discovered that I have the attention span of a squirrel when it comes to audio books, so I’ll stick with my paperbacks. And mentioning the aforementioned creativity resolution, I think you can figure out how the piano teaching went. I did teach myself Ode to Joy, so I’ll take it as a win. When I wrote my Resolutions in December, I had hinted at possibly looking into schooling options. I have dabbled a little into looking at enrollment at University of North Dakota, but that’s the furthest it’s gone. I don’t want to overwhelm myself right away with another financial burden, especially with traveling, but if it’s feasible to take a class here or there, then we’ll consider. This entry was posted in lifestyle and tagged #blogger, bbloggers, beauty blog, blog chat, blogger girl, blogger life, blogger lovin, blogger style, bloggers, blogging, blogging gals, blogging tips, creativity, fashion blog, fbloggers, financial, fitness, intellectual, life with sarah, lifestyle blog, on the blog, reading challenge, resolution, resolutions, sarah lokker, sarahhlokk, savvy blogging, second quarter, tune in, tune-up, weight loss journey. Bookmark the permalink.